Feeling your baby move is one of the most memorable moments of pregnancy. Beyond the joy of those first kicks, you also get some reassurance from your baby that everything is going well in there. A lack of fetal movement, on the other hand, can be bothersome. If your baby is just having a sleepy day, you can get her moving with a few tricks, one of which is orange juice. Orange juice is an effective way to encourage fetal movement. Most notably, the sugar in orange juice can jostle a sleeping baby and get her moving again. The sugary orange juice should have a quick effect on your baby -- you should be able to feel movements just a few minutes after you drink the juice. The cold temperature of the orange juice can also encourage movement. 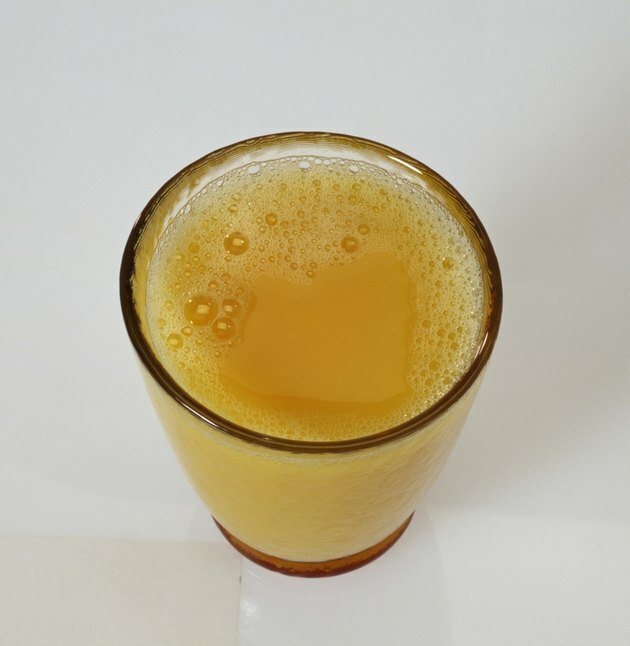 If you drink a glass of orange juice and still do not feel movement, don't panic. Instead, try a few other strategies to get your baby moving. First, lay on your left side in a quiet room. Focus on your baby's movements -- there's a chance the OJ got her moving, but her movements are slight enough that you didn't notice them. You can also jostle your belly, gently, to wake her up and encourage movement. If you are concerned about your baby's movement and have to resort to orange juice to get her moving, consider doing daily kick counts to make sure she is active enough. Your baby should move 10 times in one hour, so keep track of her movement throughout the day. If you lie down after your glass of orange juice and focus on the movement, those 10 kicks will likely come long before you've hit the one-hour limit. The American Pregnancy Association recommends starting kick counting at 28 weeks gestation. If your attempts to get your baby moving with orange juice do not work or if you notice a decline in movement, contact your obstetrician or midwife. She will probably want you to come in for fetal monitoring, where she will check the baby's heartbeat and possibly give you an ultrasound. It's better to be safe than sorry, so do not hesitate to contact your provider if the OJ doesn't get your little one kicking.